Help : The Role Window allows you to define the different roles that users of this system will have. Roles control access to windows, tasks, reports, etc. For a client an Administrator and User role are predefined. You may add additional roles to control access for specific functionality or data. You can add users to the role. Note that access information is cached and requires re-login or reset of cache. Help : Define the role and add the client and organizations the role has access to. You can give users access to this role and modify the access of this role to windows, forms, processes and reports as well as tasks. If the Role User Level is Manual, the assigned acces rights are not automatically updated (e.g. 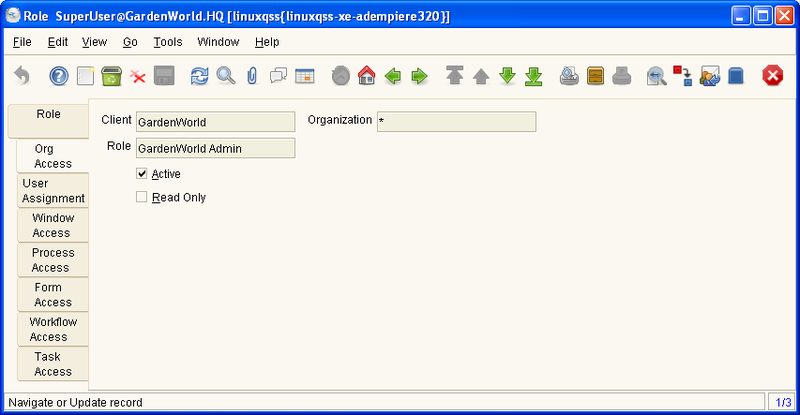 if a role has a restricted number of Windows/Processes it can access). You need to add organizational access unless the role has access to all organizations. 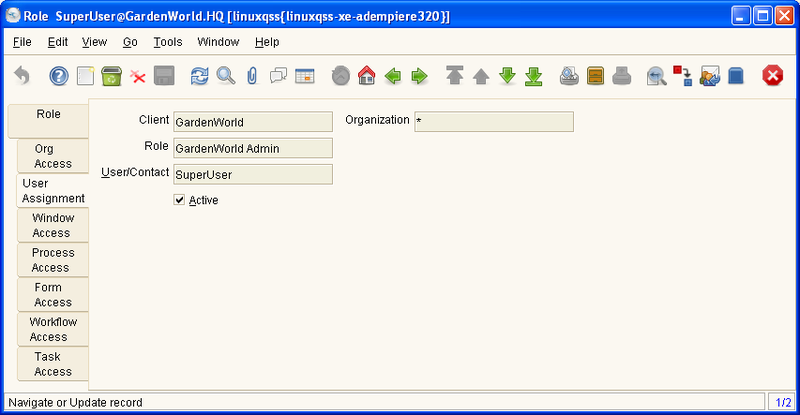 The SuperUser and the user creating a new role are assigned to the role automatically. If you select an Organization Tree, the user has access to the leaves of summary organizations. Note: You cannot change the System Administrator role. Help : Add the client and organizations the user has access to. Entries here are ignored, if User Org Access is selected or the role has access to all roles. Help : The User Assignment Tab displays Users who have been defined for this Role. Help : The Window Access Tab defines the Windows and type of access that this Role is granted. Help : The Process Access Tab defines the Processes and type of access that this Role is granted. Help : The Form Access Tab defines the Forms and type of access that this Role is granted. Help : The Workflow Access Tab defines the Workflows and type of access that this Role is granted. Help : The Task Access Tab defines the Task and type of access that this Role is granted. 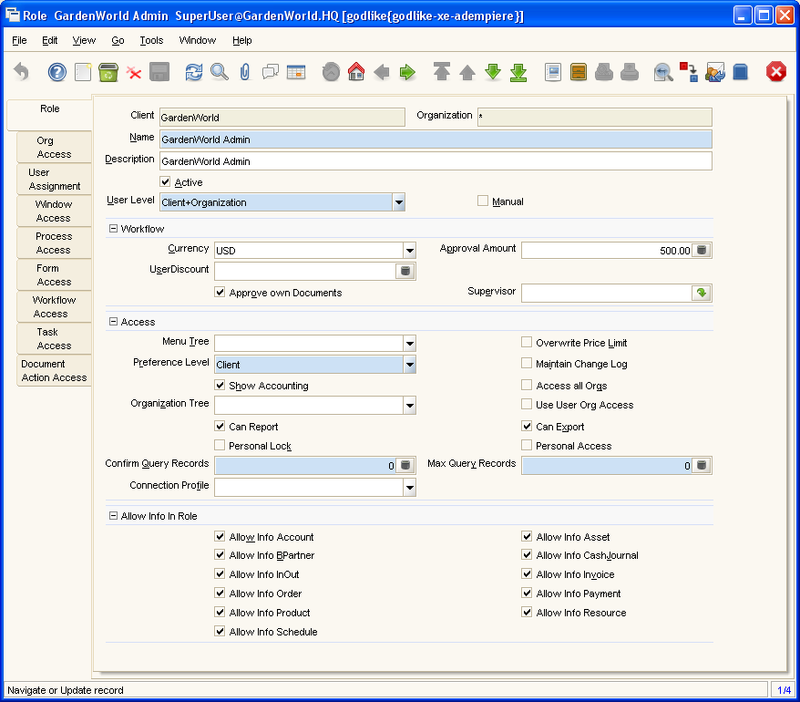 Description : Define access to document type / document action / role combinations. Help : Define access to document type / document action / role combinations.